Payan, A., Fattahi, M., Roozbehani, B., Jorfi, S. (2018). Enhancing Photocatalytic Activity of Nitrogen Doped TiO2 for Degradation of 4-Chlorophenol under Solar Light Irradiation. Iranian Journal of Chemical Engineering(IJChE), 15(3), 3-14. A. Payan; M. Fattahi; B. Roozbehani; S. Jorfi. "Enhancing Photocatalytic Activity of Nitrogen Doped TiO2 for Degradation of 4-Chlorophenol under Solar Light Irradiation". 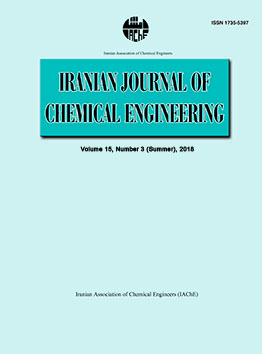 Iranian Journal of Chemical Engineering(IJChE), 15, 3, 2018, 3-14. Payan, A., Fattahi, M., Roozbehani, B., Jorfi, S. (2018). 'Enhancing Photocatalytic Activity of Nitrogen Doped TiO2 for Degradation of 4-Chlorophenol under Solar Light Irradiation', Iranian Journal of Chemical Engineering(IJChE), 15(3), pp. 3-14. Payan, A., Fattahi, M., Roozbehani, B., Jorfi, S. Enhancing Photocatalytic Activity of Nitrogen Doped TiO2 for Degradation of 4-Chlorophenol under Solar Light Irradiation. Iranian Journal of Chemical Engineering(IJChE), 2018; 15(3): 3-14. The nitrogen doped TiO2 as heterogeneous photocatalyst via sol-gel method were successfully synthesized. The physicochemical, morphological and textural characteristics of the obtained TiO2 samples were characterized by advanced analysis techniques. The photocatalytic activity of the samples were evaluated for degradation of 4-CP under solar irradiation. The as-synthesized photocatalysts were characterized with X-ray diffraction (XRD), surface area measurements (BET and BJH), Fourier transform infrared spectroscopy (FT-IR), field emission scanning electron microscopy (FE-SEM), energy dispersive spectroscopy (EDS) and energy dispersive X-ray spectrum (EDX). The activities of as-prepared TiO2 photocatalysts were examined for the degradation of 4-Chlorophenol aqueous solution under solar irradiation in a photoreactor and photocatalytic degradation mechanism and pathway have been investigated. The results show that the 3% wt. N-doped TiO2 nanoparticles under conditions (solution pH of 4.0, catalyst loading of 2 g/L, initial 4-CP concentration of 10 mg/L, Time of 8 h) exhibits much higher photocatalytic degradation efficiency (91%) as compared with that of 5% wt. N-doped (83%), 1% wt. N-doped (71%), and pure TiO2 (35%). Jyoti, K. K. and Pandit, A. B., “Water disinfection by acoustic and hydrodynamic cavitation”, Biochem. Eng. J., 7 (3), 201 (2001). Comninellis, C., Kapalka, A., Malato, S., Parsons, S. A., Poulios, I. and Mantzavinos, D., “Advanced oxidation processes for water treatment: Advances and trends for R&D”, J. Chem. Technol. Biotechnol., 83 (6), 769 (2008). Bamuza-Pemu, E. and Chirwa, E. M. N., “Photocatalytic degradation of taste and odour causing compounds in natural water sources”, Chem. Eng. Trans., 23, 387 (2010). Kuvarega, A. T., Krause, R. and Mamba, B. B., “Nitrogen/palladium-codoped TiO2 for efficient visible light photocatalytic dye degradation”, J. Phys. Chem. C, 115 (45), 22110 (2011). Jaiswal, R., Patel, N., Dashora, A., Fernandes, R., Yadav, M., Edla, R., Varma, R. S., Kothari, D. C., Ahuja, B. L. and Miotello, A., “Efficient Co-B-codoped TiO2 photocatalyst for degradation of organic water pollutant under visible light”, Appl. Catal. B: Environ., 183, 242 (2016). Feng, L., Jiang, H., Zou, M., Xiong, F., Ganeshraja, A. S., Pervaiz, E., Liu, Y., Zou, S. and Yang, M., “Enhanced photocatalytic degradation of dye under visible light on mesoporous microspheres by defects in manganese-and nitrogen-co-doped TiO2”, J. Nanoparticle Res., 18, 278 (2016). Jaiswal, R., Bharambe, J., Patel, N., Dashora, A., Kothari, D. C. and Miotello, A., “Copper and nitrogen co-doped TiO2 photocatalyst with enhanced optical absorption and catalytic activity”, Appl. Catal. B: Environ., 168-169, 333 (2015). Venkatachalam, N., Palanichamy, M. and Murugesan, V., “Sol–gel preparation and characterization of alkaline earth metal doped nano TiO2: Efficient photocatalytic degradation of 4-chlorophenol”, J. Mol. Catal. A: Chem., 273, 177 (2007). Andronic, L., Enesca, A., Vladuta, C. and Duta, A., “Photocatalytic activity of cadmium doped TiO2 films for photocatalytic degradation of dyes”, Chem. Eng. J., 152 (1), 64 (2009). Mazloomi Tabaei, H. S., Kazemeini, M. and Fattahi, M., “Preparation and characterization of visible light sensitive nano titanium dioxide photocatalyst”, Sci. Iran., 19 (6), 1626 (2012). Yang, X., Wang, S., Sun, H., Wang, X. and Lian, J., “Preparation and photocatalytic performance of Cu-doped TiO2 nanoparticles”, Trans. Nonferrous Met. Soc. China, 25 (2), 504 (2015). Kalantari, K., Kalbasi, M., Sohrabi, M. and Royaee, S. J., “Enhancing the photocatalytic oxidation of dibenzothiophene using visible light responsive Fe and N co-doped TiO2 nanoparticles”, Ceram. Int., 43 (1), 973 (2017). Wang, T., Meng, X., Liu, G., Chang, K., Li, P., Kang, Q., Liu, L., Li, M., Ouyang, S. and Ye, J., “In situ synthesis of ordered mesoporous Co-doped TiO2 and its enhanced photocatalytic activity and selectivity for the reduction of CO2”, J. Mater. Chem. A, 3 (18), 9491 (2015). Ohno, T., Mitsui, T. and Matsumura, M., “Photocatalytic activity of S-doped TiO2 photocatalyst under visible light”, Chem. Lett., 32 (4), 364 (2003). Irie, H., Watanabe, Y. and Hashimoto, K., “Carbon-doped anatase TiO2 powders as a visible-light sensitive photocatalyst”, Chem. Lett., 32 (8), 772 (2003). Veréb, G., Manczinger, L., Oszko, A., Sienkiewicz, A., Forro, L., Mogyorósi, K., Dombi, A. and Hernádi, K., “Highly efficient bacteria inactivation and phenol degradation by visible light irradiated iodine doped TiO2”, Appl. Catal. B: Environ., 129, 194 (2013). Jagadale, T. C., Takale, S. P., Sonawane, R. S., Joshi, H. M., Patil, S. I., Kale, B. B. and Ogale, S. B., “N-doped TiO2 nanoparticle based visible light photocatalyst by modified peroxide sol-gel method”, J. Phys. Chem. C, 112 (37), 14595 (2008). Yang, K., Dai, Y. and Huang, B., “Understanding photocatalytic activity of S-and P-doped TiO2 under visible light from first-principles”, J. Phys. Chem. C, 111 (51), 18985 (2007). Wu, G., Wang, J., Thomas, D. F. and Chen, A., “Synthesis of F-doped flower-like TiO2 nanostructures with high photoelectrochemical activity”, Langmuir, 24 (7), 3503 (2008). Villa, K., Black, A., Domènech, X. and Peral, J., “Nitrogen doped TiO2 for hydrogen production under visible light irradiation”, Sol. Energy, 86 (1), 558 (2012). Asahi, R., Morikawa, T., Irie, H. and Ohwaki, T., “Nitrogen-doped titanium dioxide as visible-light-sensitive photocatalyst: Designs, developments, and prospects”, Chem. Rev., 114 (19), 9824 (2014). Myilsamy, M., Mahalakshmi, M., Murugesan, V. and Subha, N., “Enhanced photocatalytic activity of nitrogen and indium co-doped mesoporous TiO2 nanocomposites for the degradation of 2, 4-dinitrophenol under visible light”, Appl. Surf. Sci., 342, 1 (2015). Kalantari, K., Kalbasi, M., Sohrabi, M. and Royaee, S. J., “Synthesis and characterization of N-doped TiO2 nanoparticles and their application in photocatalytic oxidation of dibenzothiophene under visible light”, Ceram. Int., 42 (13), 14834 (2016). El-Sheikh, S. M., Khedr, T. M., Hakki, A., Ismail, A. A., Badawy, W. A. and Bahnemann, D. W., “Visible light activated carbon and nitrogen co-doped mesoporous TiO2 as efficient photocatalyst for degradation of ibuprofen”, Sep. Purif. Technol., 173, 258 (2017). Jorfi, S., Barzegar, G., Ahmadi, M., Darvishi Cheshmeh Soltani, R., Jafarzadeh Haghighifard, N., Takdastan, A., Saeedi, R. and Abtahi, M., “Enhanced coagulation-photocatalytic treatment of acid red 73 dye and real textile wastewater using UVA/synthesized MgO nanoparticles”, J. Environ. Manage., 177, 111 (2016). Ahmadi, M., Ramezani Motlagh, H., Jaafarzadeh, N., Mostoufi, A., Saeedi, R., Barzegar, G. and Jorfi, S., “Enhanced photocatalytic degradation of tetracycline and real pharmaceutical wastewater using MWCNT/TiO2 nano-composite”, J. Environ. Manage., 186, 55 (2017). Reda, S. M., Khairy, M. and Mousa, M. A., “Photocatalytic activity of nitrogen and copper doped TiO2 nanoparticles prepared by microwave-assisted sol-gel process”, Arab. J. Chem., (2017) 10.1016/j.arabjc.2017.02.002. Cheng, X., Yu, X., Xing, Z. and Yang, L., “Synthesis and characterization of N-doped TiO2 and its enhanced visible-light photocatalytic activity”, Arab. J. Chem., 9, S1706 (2016). Kavitha, V., Ramesh, P. S. and Geetha, D., “Synthesis of Cu loaded TiO2 nanoparticles for the improved photocatalytic degradation of Rhodamine B”, Int. J. Nanosci., 15, 1660002 (2016). Khan, M., Yi, Z., Gul, S. R., Wang, Y. and Fawad, U., “Visible-light-active silver-, vanadium-codoped TiO2 with improved photocatalytic activity”, J. Mater. Sci., 52 (10), 5634 (2017). Mozia, S., Bubacz, K., Janus, M. and Morawski, A. W., “Decomposition of 3-chlorophenol on nitrogen modified TiO2 photocatalysts”, J. Hazard. Mater., 203, 128 (2012). Hu, S., Li, F. and Fan, Z., “Preparation of visible light responsive N doped TiO2 via a reduction–nitridation procedure by nonthermal plasma treatment”, Appl. Surf. Sci., 258 (3), 1249 (2011). Abdel-Wahab, A.-M. A. and Gaber, A. E.-A. M., “TiO2-photocatalytic oxidation of selected heterocyclic sulfur compounds”, J. Photochem. Photobiol. A Chem., 114 (3), 213 (1998). Zhao, C., Pelaez, M., Dionysiou, D. D., Pillai, S. C., Byrne, J. A. and O’Shea, K. E., “UV and visible light activated TiO2 photocatalysis of 6-hydroxymethyl uracil, a model compound for the potent cyanotoxin cylindrospermopsin”, Catal. Today, 224, 70 (2014). Li, X., Cubbage, J. W. and Jenks, W. S., “Photocatalytic degradation of 4-chlorophenol. 2. The 4-chlorocatechol pathway”, J. Org. Chem., 64 (23), 8525 (1999). Li, X., Cubbage, J. W., Tetzlaff, T. A. and Jenks, W. S., “Photocatalytic degradation of 4-chlorophenol. 1. The hydroquinone pathway”, J. Org. Chem., 64 (23), 8509 (1999). Thomas, J., Radhika, S. and Yoon, M., “Nd3+-doped TiO2 nanoparticles incorporated with heteropoly phosphotungstic acid: A novel solar photocatalyst for degradation of 4-chlorophenol in water”, J. Mol. Catal. A Chem., 411, 146 (2016).